Can I Sue My Solicitor For Negligence? Examples Of Solicitor Negligence. Even though part of a solicitor’s job is to sue, it does not make him or her immune from being sued in their professional capacity. A solicitor can be sued for negligence just like any other professional person and professional negligence cases are actually fairly common. Whether you can sue your solicitor for negligence will depend on a variety of factors. 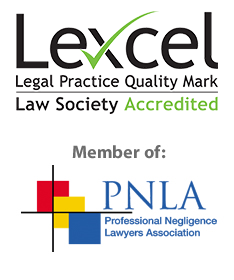 We will explore those in this article and also provide examples of solicitor negligence. If you need help with a solicitor negligence claim, please call us as soon as possible on 0800 043 9981 or dial 0333 577 0172 from a mobile or complete our Free Online Enquiry and we’ll be happy to have a no obligation chat with you and explain your legal rights and options. Establishing your solicitors negligence – duty of care. In legal terms, for someone to be liable for negligence, a ‘duty of care’ must first exist. There are certain special relationships that the courts recognise as having a duty of care present and the solicitor and client relationship has been established as one of these. The next thing that must to be examined when looking at whether you can sue your solicitor for negligence, is if there has been a breach of the duty of care that a solicitor has for their clients. Establishing loss or damage caused by your solicitor’s negligence. Next to consider is whether you, the solicitor’s client, have suffered loss or damage as a result of your solicitor’s breach of duty (should one exist). Since you have found your way to this article, you may have already pondered this. Establishing the loss was caused by your solicitors negligence. Finally, the loss or damage incurred must have an established chain of causation from the act(s) considered a breach of duty, which includes establishing that the damage suffered must not be too remote from the purported negligent act(s). It is up to the claimant (specifically, the legal team representing the claimant) to prove what was most probable, except where the acts of third parties would have been involved, had the correct advice been given, in which case, the Claimant has to establish that he had a significant chance that the third party would have acted in a particular way. The latter test is used in many situations but the most obvious one is a complete loss of chance claim, for example in a litigation claim lost through the Solicitor’s negligence, the Claimant can sue the Solicitor for the lost chance that he could have won the case had he not been prevented from doing so by the Solicitor’s negligence. Taking advice about suing your solicitor for negligence. If you believe that you have suffered a significant loss or damage at the hands of your solicitor then it is best to seek advice as you may wish to sue your solicitor for negligence, but may also be fearful of going up against a legal practitioner. For example, their insurance will often allow for an expensive legal team to assist them as a defendant. Such legal assistance will also be well-versed in the defences used when a solicitor is sued for negligence. At Matthew Wilkinson Solicitors, we have a wealth of experience to draw from that will help conciliate this possible advantage. Matthew Wilkinson himself has nearly 30 years’ experience with handling solicitor’s negligence claims and Matthew Wilkinson Solicitors deal with cases of this specialism on a daily basis. If you have not suffered a significant financial loss you may, in the first instance, take up your complaint directly with the solicitor concerned and this may be all that is needed to resolve the issue. Your solicitor should also remind you of the Legal Ombudsman’s services at this point. If your complaint is not dealt with satisfactorily by your solicitor, the Legal Ombudsman may be your next port of call. Please be aware that awards from the Legal Ombudsman are generally quite modest and often will not cover your financial losses. If you accept the decision the Legal Ombudsman makes then you cannot bring to court a claim in negligence on the same set of circumstances. You are welcome to contact us to seek advice on whether the Legal Ombudsman’s service is the best route for you. The most common areas of solicitor’s negligence cases we have seen over the years are Property and Conveyancing and all types of Litigation , however we have experience of handling claims in nearly all types of Solicitors’ and Lawyers’ work. We understand how these types of cases can be overwhelming in themselves, without having to endure the negligence of a solicitor, on top of everything else. Call us today on 0800 043 9981 or dial 0333 577 0172 if calling from a mobile, for a no-obligation discussion of your case. iii)Bolam v. Friern Hospital Management Committee (1957) 1 WLR 582 (QBD): Precedent for the standard of care for ‘professional or skilled’ defendants (trained or experienced in a specific area).